Tag Archives for " Erik Larson "
It’s guest post day here at Duct Tape Marketing and today’s guest post is from Erik Larson – Enjoy! You see neighboring businesses, competitors, and everyone else get customers through their door, and you’re getting nothing. So you ask around, trying to figure out what’s going on. You keep hearing your friends tell you “My customers keep telling me they ‘saw me on Google’ or they ‘found me through their smartphone’”. You have a website! That one guy you paid way too much money to put up your website said you would be found on Google! What gives? Welcome to Google My Business, a free service provided by Google. I know it can be frustrating to see your competitors looking really good on Google, and you’re nowhere to be found, I understand that. I also understand the idea of getting your business up on Google can be intimidating, the idea of going through a huge elaborate process, jumping through hoops, and not understanding any of it is scary. But guess what, it’s surprisingly easy. Using the built-in Google My Business tutorial, you will usually be able to get setup and going in an hour or less. Anyone that has a basic understanding of how to use the Internet can do this, so by the sole reason that you are reading this blog post, I believe in you. Let’s get started so we can get you some more customers, shall we? Once you have these things ready, go to http://www.google.com/business/, and click on the “Get on Google” button. Follow all the directions exactly, make sure to fill out as much as possible. Once you’ve got your account setup and verified, it could take a couple days to get your business in the results. Alright, so now that your account is setup and verified, here’s the tricky part, making your business stand out on the search page. 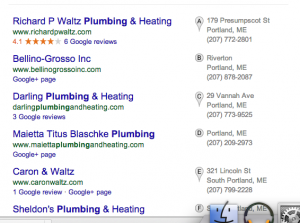 I typed “Plumbing in Portland, Maine” and I got these results. Which result do you think gets the most clicks? As you might have guessed by the lack of reviews on the front page, getting a Google Review can be kind of tough. I’ve seen a lot of companies with Google profiles that have been up for a long time, and still don’t have any reviews. So, how do we go about getting these elusive reviews? Find the “Write a review” link, right click it and copy the link. Send that link to 30 of your best and favorite customers, and ask them to write a review. In the email, make sure you thank them for being an amazing customer, and make sure to thank them again after they wrote the review. If you are a customer of theirs as well, you can offer to do the same thing for them. Once those reviews start rolling in, you’ll likely notice a bump in traffic to your site, your Google+ page, and your business. Wait, you want even more customers? Well, if you have the money, there’s a way to boost the amount of people coming to your website dramatically. 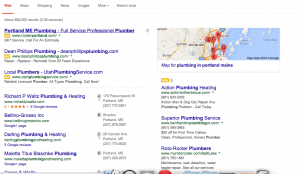 If you’re a brick-and-mortar business, Google Adwords Express let’s you show up in Google Maps results, and you’ll show up in the yellow bar in Google search. It’s pretty easy to setup, and it’ll run automatically. If you want to go more in-depth, you could run a campaign in Google AdWords, there are tons of great tutorials out there to help you out. Now, the next step is to get your business set up in Bing Places, to take advantage of all of the Siri and Windows Phone users out there. How many of you have used Google My Business? How has it helped your company? Erik Larson is the founder of RunTheMarket, a small business marketing blog. He is also the SEO specialist for Lendio, a free online tool to find business loans, and writes on small business topics on the Lendio Blog. He can also be found on Google+ and Twitter.